In sketching out the prospects for financial simulation, Mattessich goes as far as describing the spreadsheet as a "management wind tunnel." 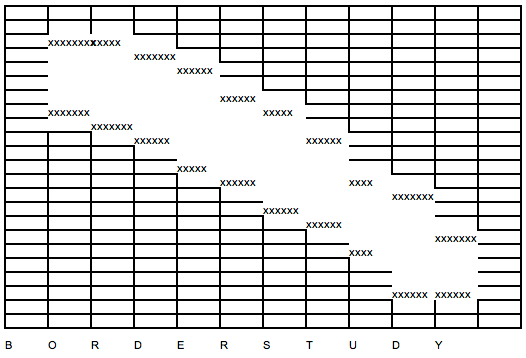 In 1969 Rene K. Pardo and Remy Landau patented the LANguage for Programming Arrays at Random (LANPAR) spreadsheet compiler for budgeting within approximately 20 North American telecom corporations. LANPAR was a technical marvel that implemented a natural order recalculation algorithm (for auto updating values) and forward referencing (for calling values from other cells) — both of these features would eventually become standard across all spreadsheet applications.3 In 1979 Dan Bricklin and Bob Frankston released VisiCalc and the novel WYSIWYG interface of this application made it a runaway hit on the Apple II. 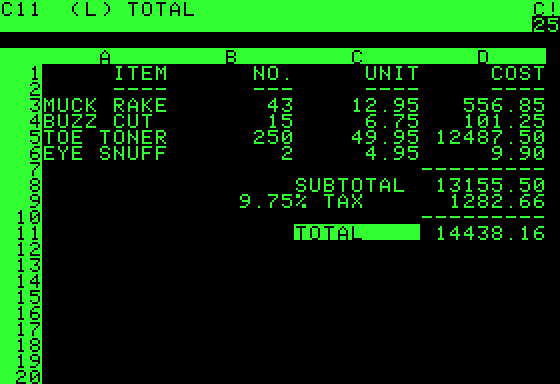 The functionality of VisiCalc was cloned and further refined in Lotus 1-2-3 (1983) and Microsoft Excel (1985) and both of these applications flourished as tools for corporate and personal accounting. The basic functionality, interface and underlying file formats for spreadsheet programs were firmly established by the mid-1980s and remain (largely) unchanged to this day. Given that the spreadsheet is one of the universal documents of "the digital everyday," there have been surprisingly few attempts by artists to engage this template for organizing information. Danielle Aubert started experimenting with Microsoft Excel in 2005 and rather than comply with the software's predisposition for managing data, the Detroit-based artist explored it as a drawing tool. The stock operations of defining cell boundaries and dimensions, adding color fills, justifying text and adding annotations were considered as a means to create dozens of abstract and representational vignettes. In a 2006 interview Aubert elaborated on her methodology in making these drawings as an attempt to make "small art": they were worked on daily, produced quickly and without much reflection. Later in the same conversation the artist suggested that "everyone should try using PowerPoint or Excel as an art medium... [n]ot in support of Microsoft, but in support of the people who have to use Microsoft every day." On one hand, we have an expression of solidarity with office workers and on the other, an adherence to the constraints of a very limited interface. Time was also an important metric for organizing this work and these drawings were bundled by duration — Aubert produced an artist book (16 months of work), an animation (4.5 months) and a series of web drawings (58 days). Each of these exercises demonstrates a desire to extend the logic of the spreadsheet into another media format. The resulting compendiums riff on the conventions of the annual report, monograph, documentary and website. The visual language of this work is predictably granular, but Aubert demonstrates considerable expressive range given her limitations — the works are careful considerations of composition, texture and negative space. The entire undertaking shares similarities with Cory Arcangel's 2002 project Data Diaries which (generatively) codifies each day as a grid study. Craig Leonard's Artists in Artist-Run Centres: Ontario 1971-2006 (2006) is a related example of an artist book of spreadsheet style pages that index the exhibitions, performances and collaborations of several generations of artists. One of the central preoccupations of the Dutch artist Jan Robert Leegte is the decomposition of digital environments. Several of the artist's projects deal with the physical reconstruction of familiar interface elements like scrollbars and situate these glowing, seemingly immaterial entities in an installation context. This technique of defamiliarization is also applied to static screen captures of popular web services where titles and content are stripped away to reveal the underlying structure of these sites. Untitled[hotmail] (2000) is an example of web erasure that Leegte describes as the "rough chopping" of a robust website down to a smattering of isolated punctuation marks and truncated HTML, left adrift in a sea of empty rows.4 Although this work is not explicitly of the spreadsheet, the piece is emblematic of how many dot-com era (and earlier) net.art projects foregrounded the tabular document space of the web. In the aforementioned interview, Danielle Aubert expresses a desire for Excel drawings to turn into a genre so that her spreadsheet drawings might become "completely uninteresting." It only follows that an artist dabbling with the trappings of accounting would openly strive for banality. Perhaps the moment for appropriating these tools has passed and those interested in engaging data or riffing on financial protocol are busy harnessing the OpenGL library for visualization with Processing or collecting data for annual reports. In the 1980s and early 90s many computer games came equipped with a ctrl-b "boss key" that would allow a player to instantaneously switch from gameplay to a fake office application — often a spreadsheet. This feature asserted a direct connection between work and play and the interrelationship between the software associated with each of these states. Aubert's graphic diaries (continue to) suggest the possibility of implementing a ctrl-p "play key" in one of the more mundane sites of production within everyday digital life. Will anyone else press it? Is there anything else to be done here? 2. Mattessich, Richard. "Budgeting Models and System Simulation" in The Accounting Review. July 1961. pg. 386. 4. Quotes on the Hotmail pieces have been culled from Leegte's statement in Glitch: Designing Imperfection. Pg. 128. where the artist describes the remnants of the Hotmail interface as "scraps and dust in an abandoned building." Greg J. Smith is a Toronto-based designer with an active interest in the intersection of space and media. He is co-editor of the digital arts publication Vague Terrain and blogs at Serial Consign. For awhile, I've been using the spreadsheet as a semi-structured form for capturing and working with "improvised knowledge." Thought you might be interested in viewing my interactive performance lecture, "What is Thought," that covers some of the same ground you discuss above.